Texas’s innovation leader in UAV drone geospatial data acquisition, assessment, analysis, and processing. From our office in Houston, Texas – Ventus specializes in the integration of advanced drone data acquisition technologies with high performance GIS analysis and visualization tools to produce rich client specific geospatial data sets, high quality imagery, terrain feature models, geo-referenced asset inspection, and facilities management information. Our patented drone pipeline leak inspection service, Geospot, provides data quality and coverage of infrastructure at a level of detail and accuracy not possible using previous technology! We are Geomatics Professionals, Remote Sensors, GIS Specialist, and Surveyors, who use Drones for Service , or UAVs to collect geospatial information on land and land based geographical assets, such as pipelines, refineries, roads, well sites, and bridges, using special processes, and patented techniques. Our staff of experts use multiple platforms and specialized software to find what you are looking for, be it gas leaking from a pipe or 3D engineering grade points clouds of difficult terrain, we have the team to accomplish our mission. At Ventus, we help you the customer make informed, actionable decisions with advanced real time data analytics and data driven services. Our data services provide the customer with Timely, Accurate & Precise, Credible, and Relevant data to make informed decisions easier, and cost effective for the end user. Ventus Geospatial is an acknowledged industry leader in the acquisition and analysis of rich imagery acquired by remote sensing from drone platforms. In our 7 years of experience, we have flown thousands of missions without incident, possess FAA part 107 operations certificates. We work mainly in Texas & New Mexico (Permian), North Dakota (Bakken), and the Appalachians pipelines, using satellites, aircraft, or drones. Focusing on mapping, aerial surveys, seismic survey, pipeline integrity, geomatics engineering , for the O&G and engineering firms in USA & Canada. Ventus has worked from the high arctic in Alaska, and Northern Canada, to areas in Southern Mexico and across the USA from Virginia to California! We take a wholistic view of your problem, and apply the latest technology and innovation to provide the most cost effective and timely solutions. We have the experts in place to meet your needs, and the spirit of innovation to find the right solution to your problem. Everything we do is to help the client meet his needs, and provide actionable information for better decision making. Ultra high-resolution aerial ortho-imagery, highly accurate digital topographic surveys, gas mapping and advanced spatial analysis supply the foundation for a comprehensive suite of information services which directly benefit pipeline monitoring, inspection and management. 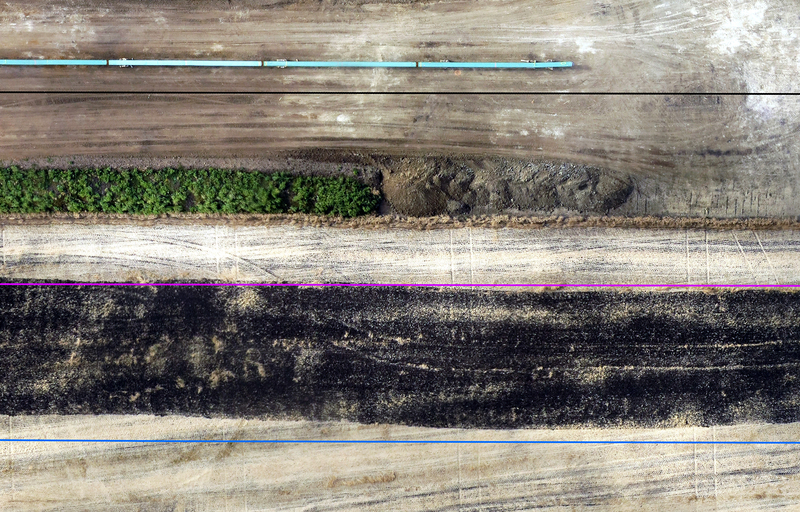 Ventus Geospatial leverages the latest in geomatics and Unmanned Aerial System (UAS) technology and geomatics expertise to acquire seamless high-resolution aerial imagery, topographic information and gas concentrations over pipeline right-of-way. This unique capability enables data acquisition, processing and analysis to provide cost-effective, comprehensive solutions when compared to more costly, manned aircraft systems or helicopter flights. Ventus Geospatial is a world leader in the successful development of the first unmanned aerial gas detection system. The gas detection system utilizes the latest in Unmanned Aerial Systems (UAS) technology equipped with cutting-edge laser mass spectrometer to effectively detect gasses down to 1 ppm. This highly advanced gas detection system is backed by powerful analytics and software which has been researched and developed to account for atmospheric and meteorological conditions during flight planning to best detect potential leaks.Those leaks are then analysed by specialists to calculate the highest-likelihood location of an actual leak source based on advanced gas plume modelling. Natural gas pipeline leak detection, liquefied natural gas (LNG) production, storage, and transport, GHG monitoring and facility monitoring area ideal applications for this gas detection service. The use of unmanned aerial systems (UAS) allows for the capture of detailed aerial imagery as well as georeferenced topographic data with absolute accuracy of 10 cm. UAS allow for a highly efficient data capture methodology to be employed, providing an all encompassing data set over the entire area of interest. Conventional seismic survey methodology is limited to the area a person can physically cover in the allotted time frame, this dramatically limits the completeness and accuracy of the hazard survey. UAS topographic data and aerial imagery also offer the ability to easily modify plot maps and snail trails with existing digital imagery and topographic data without the need to capture further field data or delaying seismic operations. Though the use of this advanced technology HSE exposure can be vastly reduced as the need for surveyors to be “working alone” in remote areas is removed and the efficiency to the UAS platforms allows work hour exposure to be reduced by up to 90%. Ventus Geospatial leverages the latest in geomatics, Unmanned Aerial System (UAS) technology and expertise to acquire seamless topographic information and aerial imagery which serve a wide variety of engineering projects. Data acquisition is quick, comprehensive, accurate and highly detailed, making it ideal for engineering design, site selection and infrastructure development. Ventus Geospatial leverages the latest in Unmanned Aerial System (UAS) technology and expertise to acquire ultra high-resolution visual and thermal imagery which is ideal for inspecting facilities with increased safety. Data acquisition is organized to obtain complete coverage of a facility, with high-resolution images from all angles so that every aspect of condition can be inspected. Thermal inspections provide insight into building thermal efficiency by measuring relative and absolute temperatures. 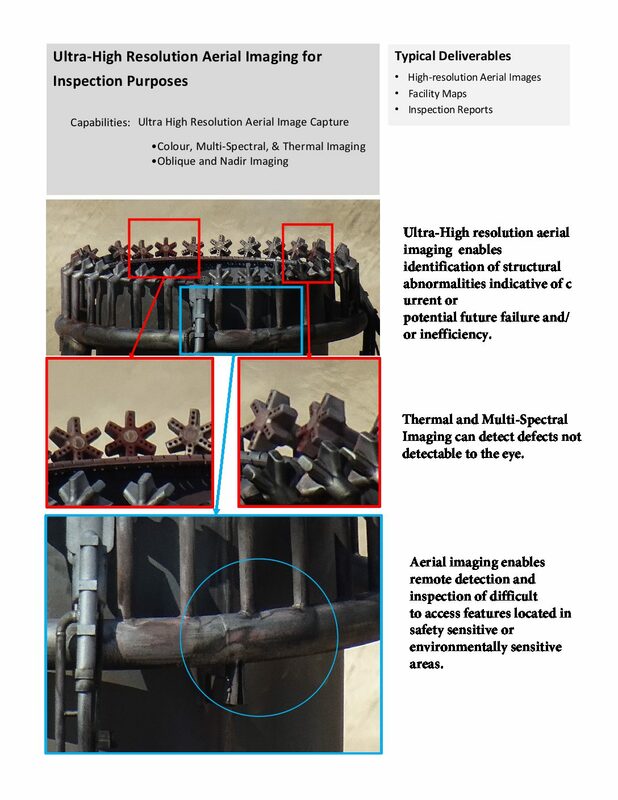 Imagery acquired during an inspection are compiled into reports which detail areas of concern or interest to support proper management practices and compliance. Ventus is ISN Networld, and Avetta safety compliant, our pilots have FAA Part 107, and we hold our operating and data collection standards to the highest level. Our pledge to you the customer is to provide the most innovative and cost effect solution to solve your problem, efficiently, effectively, and safely. Our data products are simply the best available on the market today. We use our 6+ years of experience to acquire and produce the highest quality geospatial products and services. Ventus has won numerous awards and accolades from our peers! We work as a single united team with market leading firms around the world and give our clients the highest quality services and solutions possible.